Google has as of late experimented with books that can't be printed, but now it looks like the search giant is also aiming to give physical books a digital edge. That's according to two patents filed with the US Patent and Trademark Office (USPTO) in January 2015. The more involved patent for a "Storytelling Device" describes a physical book-like device with speakers and motion and pressure sensors embedded in it. As you turn the pages, a projector near the spine of the book throws up AR-type images and the appropriate audio plays. It sounds like the device could be used for a number of books or content that could be downloaded or streamed to it, almost like an e-book reader but with pictures and audio that literally jump out at you. The patent explains that the device would have an "electronic connection" allowing it to receive book and sensor data. It also doesn't appear as though like it would require AR glasses. 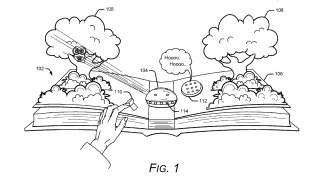 The second patent, called a "Media Enhanced Pop-Up Book," details a physical book system that would essentially allow for a second-screen experience. It would require a device, like a smartphone or tablet, that would sit behind a "pop-up page" that flips up along the top edge of the book and is attached to the physical pages. The display would then "present media associated with the detected pop-up page," presumably with an app. The patent explains that the media content would be viewable through the page. Of course, these are just patents, and doesn't mean we will see these devices come to fruition any time soon, but Google seems to have an interest in new types of hybrid e-book systems, especially with the launch of Editions at Play interactive books. Who knows, maybe it's looking to take on Amazon?